A journal of whining and vegetarian dining. 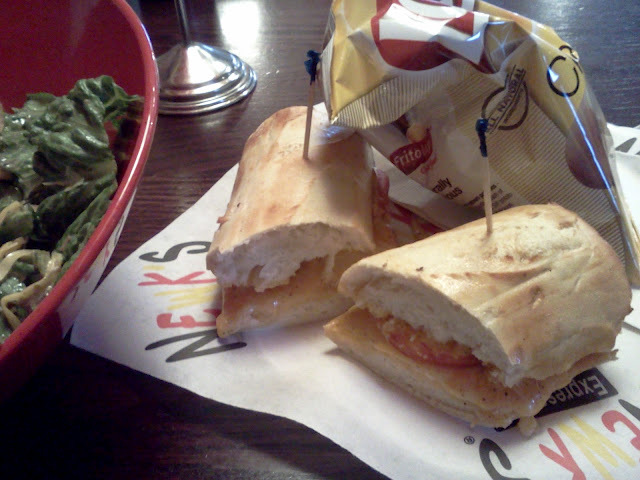 Newk's Express Cafe is a fast-casual sandwich shop based in Mississippi. It is most comparable to McAllister's, a concept that could be described a Panera Bread with Southern touches and pizza. Where McAllister's has a Southern accent, Newk's seems to have fully embraced its inner hillbilly. Despite its Southern roots, Newk's does offer plenty of options for both vegans and vegetarians. The menu is made up of toasted sandwiches, salads, soups and thin-crust pizza. The entree salads are definitely large enough to serve as a meal. There are two vegetarian sandwiches, both served on a white sandwich roll. The veggie club is made with mushrooms, roasted red and yellow peppers, pesto and goat cheese. The grilled cheese sandwich is prepared with Newk's house-made pimento cheese, which is also available for sale on its own. The sandwich is rich and slightly sweet, and it is a great use of a Southern staple. Newk's has three vegetarian pizzas.The dessert menu consists of assorted baked goods and numerous cakes. My name is Jared R. I live in Ohio and sometimes do things there. This blog covers vegetarian dining in Columbus and other places on the globe. How Do You Burn Cereal?